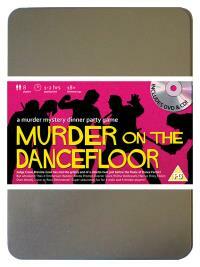 You've been invited to play the role of WOODY LEAVE in Murder on the Dancefloor. It’s the eve of the final of Dance Factor and the competition is tighter than the male dancers’ leotards. Crane Breville Cowl decides to host a pre-final bash to relieve everyone’s tension and invites the finalists and his colleagues to come along, but all he gets for his troubles is a stiletto heel in the head. Join with us to find out who stepped on Crane’s parade! Show Host (his one liners are good for old timers!) Costume Suggestion : Your smart grey three-piece suit highlights the grey and white hairs on your head and is complemented by a pocket watch and bright handkerchief folded into your breast pocket. You’re getting on a bit though and recovering from a recent rock climbing injury – so bring a walking cane! You've been in show-business for more years than you'd care to remember but your cheeky catchphrases and bad jokes still make you a favourite with the viewing public. Some people say you shouldn’t still be working at your age, but you still feel like a twenty-year-old – you even go rock-climbing in your spare time!